Finished reading Nothing to Fear by Adam Cohen. 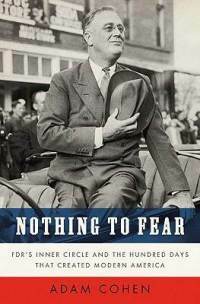 Nothing to Fear is a narrative of Franklin D. Roosevelt’s (FDR) famous first hundred days as president. Cohen focuses on the five Roosevelt aides whom he sees as having been the most influence in developing FDR’s wave of extraordinary actions. These aides were agriculture secretary Henry Wallace, presidential aide Raymond Moley, budget director Lewis Douglas, labor secretary Frances Perkins and Civil Works Administration director Harry Hopkins. Cohen states the group didn’t always mesh. The liberal Perkins, Wallace and Hopkins often clashed with Douglas, one of the few free-marketers in FDR’s court. Moley hovered somewhere in between the two camps. As Cohen illustrates, the liberals generally prevailed in debates. However, the foundation for FDR’s New Deal was crafted through a process of argument within the president’s innermost circle rather than ideological consensus. I found Nothing to Fear to be very interesting recap on historic events that help shape our country. I don’t normally read books on history but I found it fascinating to learn about the events that lead to the US leaving the gold standard.